​It has been pleasing for me that I have been able to build a relationship with NG Models, who have been easy to work with and open to suggestions, as anyone on DAC can attest to. In recent months they have taken to sending me sample models of new moulds for review and for me to publicise. So far this has involved the 737-800s and the Beluga but it was a surprise to receive a package a couple of days ago with two new moulds I didn’t even know were being developed! ​The A330 is without a doubt one of the most important airliners of the past 20 years. It has really achieved its potential and, like the 727, 757 and 767 before it, has done so largely without the publicity that has been lavished on other contemporary types (in this case the 777, 787, A350 and A380) whilst still selling like hotcakes. There are few major airlines today who don’t have A330s in their fleet as the type is eminently flexible and capable. ​The Panda mould is probably the best, but the Aeroclassics and Phoenix moulds are also superb. Only the JC Wings / Gemini effort is rather lacking. The AV400 mould is one that I have not seen in person, although I suspect it shares a lot with their A340, which is perfectly good. ​AV400 haven’t used their mould a lot but just last month they released a couple of TransAsia examples. 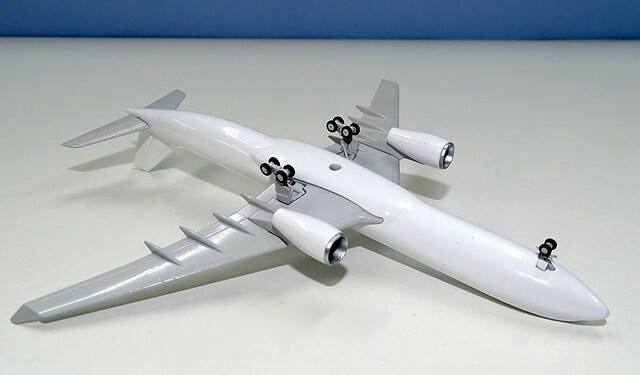 This illustrates the problem with A330s in 1:400 scale. Oversupply. TransAsia only ever operated 4 of the type and the airline went bankrupt in 2016; and yet there have now been 6 A330 releases in TransAsia colours from 4 manufacturers. ​For other airlines it is even crazier. There have been 30 Air China A330 releases, although admittedly that includes a number of special schemes. You’d have thought therefore that saturation point had been reached for A330s, but no NG Models has decided to enter the market as well. ​I questioned their move to make a 787-9, and I was wrong, so far be it from me to question this move, and once again the new moulds look excellent. When I asked NG about the new moulds they said that they were extended from the Beluga tooling (I guess they already had the wings and landing gear) and that they were ‘not a main mould to NG’ but one that helps to ‘enrich the NG product line’. ​It seems funny to make two new moulds and not use them widely and so I would expect that they will indeed get some usage. NG certainly seem to have plenty of funding as this is the 3rd completely new mould in 6 months, with the trio of Tristar moulds incoming soon. Wow. 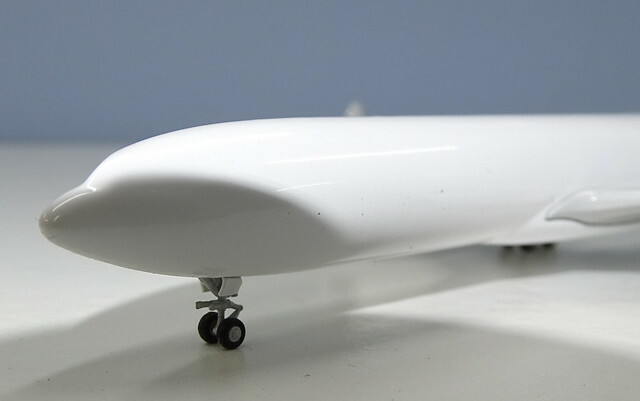 ​If anything, this is another nail in the coffin of Phoenix, who have dropped out of 1:200 scale, haven’t released a new mould in ages (aside from the 737 MAX) and are assailed on all sides by Aviation400, NG Models, Panda Models and JC Wings. How long can they last, I ask myself? ​Ok so how are the new NG moulds? Comparing them to the many A330s I own, from the various manufacturers, it easily competes against them all. The Panda and Aeroclassics moulds are close to perfect in their shape so it is no surprise that alongside them this new NG Models mould is almost indistinguishable. ​Undercarriage - The landing gear of the NG mould is excellent and has more detailing and finesse to it than anyone else’s. The forward nosegear process is present and the rearward process is well shaped and has the gap between it and the mainleg. On the downside I admit that the gear on the series 300 was loose, however and needed gluing back in. Unfortunately, the nosegear of the series 200 was broken in transit, so don’t spend too long staring at it in the photos as I had to try and glue it back, which was challenging due to distortion damage. 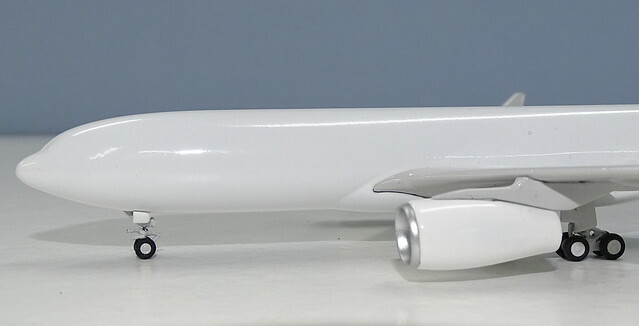 ​Engine fans - The engines are see-through – the first to my knowledge in 1:400 scale on an A330. They look very good. ​Between the variants there are the expected differences. Not only is this the length but also the A330-200 and A330-300 have slightly different vertical stabilizer forms, since the 200 has a taller, larger tail. This is correctly displayed on everyone else’s moulds as well. Interestingly Phoenix on their A330-200 use a lot larger horizontal stabilisers too. Nobody else, including NG, does this and I can’t find any evidence of them being different on the real thing. Does anyone know for certain? Phoenix horizontal stabs on the left and NG Models on the right. Does the A330-200 really have larger stabilisers? 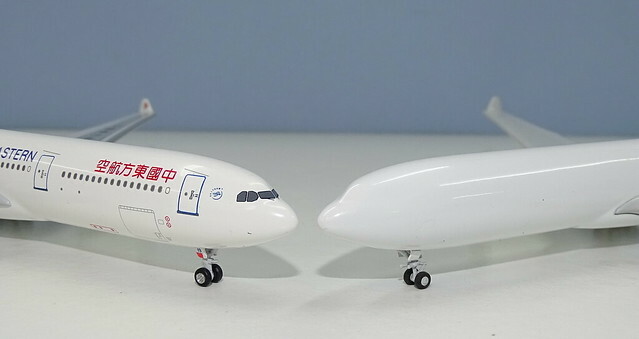 ​The overall result with the new NG Models A330 is that they are both great moulds and with the addition of the excellent printing and livery research NG is capable of they will be strong competitors to Panda, JC Wings and Phoenix especially. ​Lucky Air – JC Wings have had this on their release list for over a year but even when it does show up their mould is weak. I'm sure there are more, but these are my top 5 - what are yours? First I would like to thank you for bringing us the news about the new NG mould. I'm curious what liveries we will see. As per Airbus references the horizontal stablizers are the same on all A330 variants. It seems that Phoenix used the larger A340-600 stabilizer on their A330-200 mould by mistake. - Number 1: LEVEL, only Aeroclassics have made one, and it is very difficult to get. But They should make the neo too. And I think it’s phoenix mistake, the horizontal stablizers are too big. I was quite surprised to see this post as I was scrolling through today. I have to say, I've had a lot of issues in the past with getting my favorite airlines (On A330s), and on the moulds I think are the best. I'm very interested in what NG has to offer with this model, and will save up for when they are released!